A friend who facilitates Process Painting workshops was asked to take a look at some stone sculptures her friend had begun in her garage. This friend had a background as a sculptor from a prestigious university, yet her studio sat idle. So, my friend visited her and encouraged the beginnings of her rock art. Several months went by. The stone sculptor asked my friend to return. 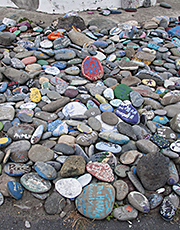 When the garage door opened, the space was filled with a multitude of rocks, found objects, and painted stones of every size and combination. Her creativity had gone wild. All she needed was the encouragement—fuel to keep her creative process flowing. The word “springboard” used in conjunction with “creative community” conveys a vision of like- minded artists acting as a “jumping off place” for creativity. Indeed, we can’t give life to our imaginings in a vacuum. We need others we respect to help us reflect on our work, to appreciate what is inspirational, and to assist in pointing out new directions to explore. Our participation in a stimulating environment supports continued discovery, revision, and encouragement to keep going when we experience creative blocks. Whether it takes the form of classes, workshops, outings, conferences, or one on one sessions, creative community matters. Portfolio reviews are a resource for photographers to build creative community with experts in the field. Filter Photo Festival is one such venue which offers workshops, lectures, panel discussions, and reviews by gallery owners, museum directors, curators, publishers from across the country. Participating in these events builds creative community for photographers with colleagues and mentors whom they might not encounter in their daily life. Expert, experienced eyes can evaluate one’s work, suggest additional resources to pursue, and provide fresh creative direction. There is even the possibility of connecting with a gallery owner enthusiastic about your work who invites your participation in an upcoming show. Copyright 2017, Lynn Anderson Fine Art, All Rights Reserved.